Reviewer's Machine : AMD Athlon 1.33ghz, 384MB RAM, Elsa GeForce3 64MB, Win98. Have you ever wanted to be immortal? Ever wondered how it would be like to wake up even after you die? 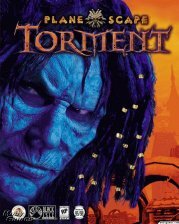 If so, Planescape: Torment has the answers to your burning questions. No, its not an afterlife simulator, it an RPG based on the D&D Planescape multiverse, which means that there are several universes and each universe has its own rules. The game takes place in a "city" called Sigil. I use quotations because it doesn't seem like a city, seems more like a bazaar or a shanty town. People from all over the place come to gather and trade. They call Sigil the city of doors because of its many portals to other universes. The story begins with you controlling the protagonist of the game, The Nameless One (AKA TNO, I'll use an abbreviation for the sake of brevity). You wake up in a mortuary and find out that your mind has been wiped clean of any memory you previously had. You also meet a friendly talking skull who proves to be a valuable party member. You later find out that you're immortal and thus begin your epic quest to self-discovery and find out whether immortality is a gift or a curse. This game is one of the very few that doesn't have a clichéd storyline, IE save the world and kill bad guy. Throughout the game you'll meet strange party members, interact with creatures from another universe, gain new skills, and also learn about the pasts of you and your companions. The game is, of course, a Dungeons and Dragons game so expect different methods of leveling up and initiating combat. Even if it is a D&D game, combat is fought the same way as with any other RPG. The only difference is the way it is handled. Now I'm no D&D expert, so I'm going to give you a very general explanation. Your character rolls a "hit dice" which is a ten sided dice and it is rolled against an opponent's. Depending on armor class and such, whoever rolls highest gets to wins over the lower dice and scores the hit. Yes I know its complicated, but you don't need to know it to play. As for leveling up, you do it by killing monsters and finishing quests. In this game, finishing quests give you more experience and gives you a chance to remember some of your memories. When you do level up, you are given a skill point to use on your skills (charisma, strength, dexterity, wisdom, and intelligence) and also a combat skill point which you can use to improve combat skills (sword, axe, etc.). You can only spend combat points by talking to a trainer. Now onto the game's interface. This game boasts one of the easiest and friendliest interfaces I have ever seen. There are very few buttons and they are easily accessed through the bottom navigation bar. The automap is one of my favorite features. Unlike Baldur's Gate's automap, PST's automap marks all the important locations, such as: stores, taverns, people's houses, entrances, places of interest, etc). It also allows you to mark locations on the map! So if you stashed your treasure somewhere, you can mark it so you don't forget the location! This feature is a big plus in my book, it's very annoying when you have to search the whole map for a store or an inn. The game offers improved graphics over Baldur's Gate, despite the fact that it is powered by the Infinity Engine, the very same that BG uses. The characters are larger in appearance and are more detailed. You can actually see The Nameless One's scars. One thing that did stand out was the spell graphics and animations. When a spell is cast, it creates a Final-Fantasy-like feeling to it. When higher level spells are cast, all characters freeze while the spell takes place and it offers some brilliant special effects like screen shakes and camera angle shifts. This game offers some of the best special effects I have ever seen in any D&D game, Baldur's Gate's special effects are garbage compared to PST's. The sound is nothing really incredible, its the usual for any RPG game, some voice acting here and there, some explosions, etc. While I did enjoy every minute of the game, I found a few annoying moments. The game's load times are extensive. Moving to a new area takes 20 - 30 seconds (based on my PC's performance). The game also loads when a spell is about to take place and when something happens like a character transformation. The CD swapping is also annoying especially when you have to jumble between 3 CDs. Other than these relatively small problems, the game was absolutely perfect. The Highs: Unique story, interesting characters, great graphics, and top notch voice acting. Bottom Line: This game is a perfect example of extraordinary creativity and vision. No self-respecting gamer should be without it, period.